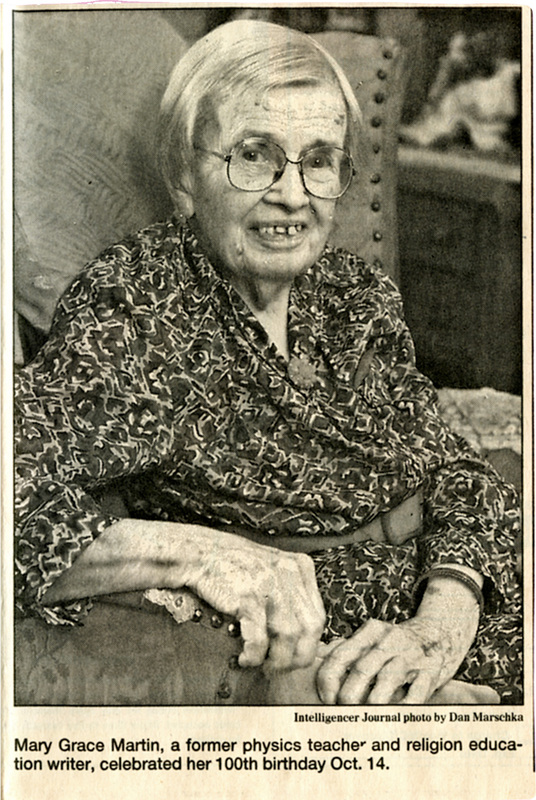 Great Aunt Mary Grace would turn 117 this week on October 14 if she were still alive. When I was young, the Longenecker family visited Mary Grace Martin at her cottage at Mt. Gretna, PA. What I remember most about her appearance was her pleasant aura and a gap-toothed smile. To my childish eyes, her teeth looked like widely spaced ivory pegs. Mary Grace Martin, the only child of a Church of the Brethren pastor, A. L. B. Martin, and my Great-Grandpa Sam Martin’s niece, traveled with her parents all around the country from Long Beach, California to Philadelphia, Pennsylvania and Baltimore, Maryland moving from one pastorate to another. A graduate of Goucher College (1921), she taught high school boys, who “thought they knew more than their teacher.” The stint lasted just one year. Mary Grace returned to Goucher College and taught physics to college students – pay $ 75.00/month. Then she earned a master of arts in education degree from Boston University in 1928. A master’s of religious education followed in 1935 from Hartford Seminary Foundation with postgraduate work at Johns Hopkins University. Later she became national children’s editor for the Church of the Brethren in Elgin, Illinois. And finally she wrote two books: “Teaching Primary Children” In 1937 and an inter-denominational guide “We Worship Together” in 1948. Mary Grace vividly remembers the sinking of the Titanic in 1912 and the end of World War I in 1918. In the Lancaster Intelligencer Journal article, she mentioned that her dad taught her to drive, but chuckled as she remarked she’d rather have a chauffeur. She also preferred cruise ships to air travel. Mary Grace Martin lived a full life enriched with books, music, and friends. I remember her gentle spirit. Of course, through the years her example has been reflected in my own life, though I certainly didn’t recognize this until now. Your story fits here: memories of a special relative, maybe an old pump organ, something else this post has sparked in your memory. 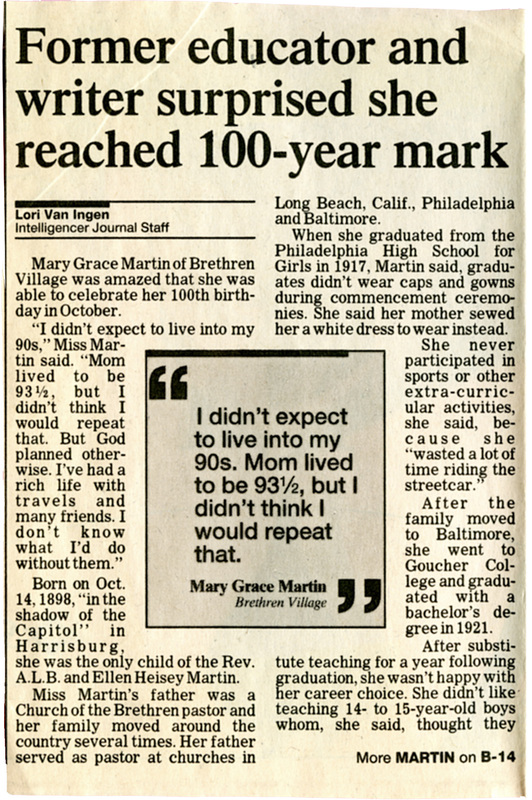 What a wonderful and fulfilled life your aunt Mary Gracy had! She was certainly a woman who used her time very well in this world. It was part of her heritage and passed on by example to my generation – and, I hope, beyond. And she did it with a sense of humor and twinkle in her eye. Thanks, Fatima. Marian, you come from a long line of long-living educators! (Try saying that quickly!) 🙂 Your great aunt sounds like a remarkable woman. That pump organ is beautiful! Is it still in your family? My husband’s grandmother had a pump organ, but nothing like this one. She played at her church sometimes, but I never really heard her play. She also made beautiful quilts–many, many quilts! The pump organ you see was actually an internet image, but in my mind’s eye, hers matched it pretty well. I don’t know who managed her estate, so sadly I don’t know what happened to it. I hope it’s still happily pumping tunes through its bellows. Quilts and organs, handiwork and music – all part of our heritage, Merril, and markers for that historical era. I’m glad you enjoyed this nostalgic note, Anita. I answered your question on my reply to Merril. Short answer: I don’t know! Like you, I am blessed with interesting relatives that lived life to the fullest. My great aunt Barbara comes to mind. I blogged about her https://darlenefoster.wordpress.com/2014/01/16/farewell-to-a-family-treasure/ I imagine she is enjoys visiting with your great aunt Grace. Here´s to all the strong women who passed on their attributes to our generation! Your great aunt Barbara’s chutzpah in her elder years is amazing: “She learned to swim at age 75, travelled to Australia and New Zealand to celebrate her 85th birthday and drove her own car until she was 93.” There is hope for us all, even late-bloomers. Pump organs in living rooms were plentiful back then. I wonder if you remember player pianos too, also popular during this era. I remember sitting in front of one in my cousin Janet’s home and experiencing a different kind of “pump,” the perforated paper rolling around metal cylinders above the jumping keys. 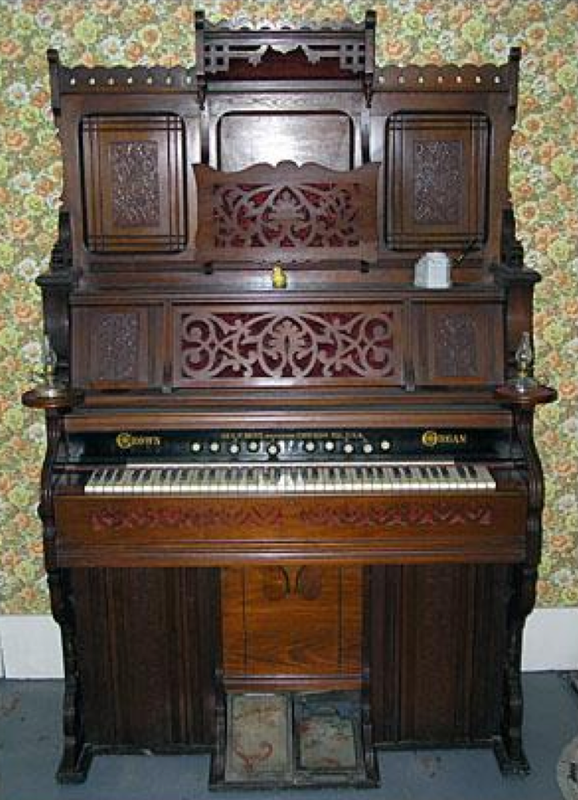 My mother at age 88.5 has a pump organ in her Landis Homes unit that looks very much like that image. She still plays her favorite hymns on it. I hope it stays in the family. Lots of memories of singing together as Mother played. Your Great Aunt must have influenced you greatly, along with your Aunt Ruthie. Not only was she a professor, but a professor of physics! Such a pioneer. No, Shirley, I haven’t thought of the Wife of Bath since I taught medieval literature classes at the college. Though Mary Grace was widely-traveled, she was certainly less earthy and hardly sexual. I just love pump organs – can you tell? 😉 How fortunate you are to have one to enjoy in your mother’s living quarters. Truthfully, I’d love to swell those bellows too. By the way, I’m making my writer/speaker debut as a blogger this Friday at my college here in Jacksonville with the title Blog to Book: Exploring Memoir. I have cited you as an impetus for blogging along with a slide of the website with your name that brought us together nearly 3 years ago. Just imagine! Thanks for the meniton and have a great time speaking. Marian — What a phenomenal, well-lived woman your Great Aunt Mary Grace was! She’s yet another remarkable example of the longevity genes you come from! And with familial influence like hers, it’s no wonder you turned out to be your incredible self! You are so good at building confidence, Laurie. “Life Coach” is a handle that fits you perfectly. As I child, I thought of petite Mary Grace as a kindly old woman with a pump organ I liked. Not until I read this article recovered from my mother’s “things” did I realize what an accomplished woman she was. What a blessing. To have so many family members with great education. What wonderful legacy. To give to your .grandchildren. so nice to see the history of our ancestors. You have great memories. What a rich life she lead! Smiled at her statement in the newspaper clipping that she wasted a lot of time riding the street cars – as her reason for no extra curricular activities! There’s nothing quite like an organ getting into its stride. That mournful melodic music really gets deep into my soul many times accompanied by joyous singing. I’m thinking of How Great Thou Art as an example … Thanks Marian! I think Mary Grace rode the street cars to go to and from places. Besides, it may have been calming for her. Glad you noticed this detail. Yes, I too love the soaring melodies of How Great Thou Art. Thanks, Susan! And places she went! – I’m meaning that too! 😉 Yes, amazing for a woman of that era, and I didn’t know about her until I read the newspaper article. Talk about women’s lib …she invented it . What a lady Mary Grace was . You must be so proud of her . You are blessed with an interesting family . I only have my immediate family , sadly . There are others around but we don’t keep in touch . I did link up with a cousin a couple of years ago . We used to email each other with stories about our families . Then for no apparent reason she stopped sending me emails , I have no idea why . I even went over my emails to see if I had offended her in any way. Guess that’s life . Thank you for reading and commenting in this column. You always turn up as a cheery, red quilt piece – ha! I’ve had disappointments too like you mention with your cousin. Sometimes I find out that the mystery has nothing to do with me (what I did or did not do) but something I didn’t realize was happening in the other person’s life. It hurts though, and I’m sorry! You’ve had so many amazing women as your role models. No wonder you are so amazing yourself! You know, Joan, as we grow up we have this one life we are living, and it’s the only one we know. At the time, I believe I thought everyone lives like this. Even with the dark side you know about, I had a wonderful upbringing. My writing and my lovely cadre of writers I am getting to know, including you, have brought this awareness into bold relief. Marian, this is beautiful: the pictures of the organ and Mary Grace, and the newspaper article with her wonderful comment about age. You did a wonderful and loving job on this post, and it shows your appreciation for the women in your life. Brava! When an author and writing coach applauds my work, I am thrilled. Yes, I do have great appreciation for the women in my ancestry. They and commenters like you keep me going. I have to admit, I do feel discouraged sometimes and often weary in well-doing. Thanks so much, Marylin for the pop of love here. So I can’t imagine you pumping away on the pedals before you pulled on those sassy green boots – ha! Great Aunt Mary Grace’s comments about boys of a certain age thinking they know more than their teacher is as true today as it was then. 😉 This is a beautiful tribute to a beloved relative. I chuckled at your “organic” confession. I assume someone was able to find a tool to extract the key, so the show could go on. I’m glad this post evoked a memory, so we can enjoy knowing about the tiny bit of mischief here – ha! If organ’s could speak. . . ! Thanks for appearing here in the comment column. Yes, I have been following your blog and leaving comments regularly. Now I wonder whether you are getting them . . . will check the link! I think we’ve gotten it all straightened out now – words flowing both directions – lol! Thank you for another delightful family story, Marian. I feel like I’ve met Great-Aunt Mary Grace through your eloquent prose and photos. What an inspiration she was. You know that saying , “the apple doesn’t fall far from the tree”. In preserving these precious family stories, you are also gifting us with a vivid glimpse into past times. We never had a pipe organ in our family so I enjoyed the video,too. Thanks, Kathy – always a constant flow of affirmation from you. And I appreciate your checking out the video too. When I check “site stats” very few people take advantage. On a lighter note, I wonder whether those boys ever get hired for weddings. Their performance almost seemed like a gag – ha! What a blast from the past seeing that pedal organ. I used to play the organ for church until I had our first child. It was hard work and I still can’t believe that I actually learnt to play at all as we had no music lessons. If a hymn had too many sharps or flats I used to transcribe it to simplify it. Don’t know how I knew that….what we do when we are young! Lovely memories you have there. Hello, Alexa from Australia! I’m glad you liked the blast from the past and I do understand the difference in technique between piano and organ – sustained versus touch-and-go. This the perfect place to share those memories. Thanks for doing just that! Beautiful Mary Grace. Thanks for telling her story. My Grandma Edna was a classically trained pianist from Chicago who moved to a farm in Missouri because her husband, my granddad, inherited the land. She was always a bit out of place there, but she loved to play the piano in church, at home, anywhere anyone would listen. When she was well into her 80s, my uncle and aunt wanted a vacation and asked her if she’d stay in a local “old aged” home for a week. She reluctantly agreed. She had so much fun playing old tunes for the appreciative seniors that she decided to stay in the nursing home rather than return to my uncle’s home. She loved family, but she was a little bored. She needed her music. You have just written a beautiful homage to Grandma Edna here – lovely! I hope others will read it and smile. I just read in my sister Jan’s old sociology notes (confiscated from the attic) that our Grandma Longenecker would bang on the piano to release her anger. I also saw her play the instrument as an act of worship. Ah, the sound of music!